LAKE SUCCESS, N.Y., October 20, 2009 – Canon U.S.A., Inc., a leader in digital imaging, is proud to introduce the next evolution in the EOS 1D series of cameras: the Canon EOS-1D Mark IV Digital SLR camera. The EOS-1D Mark IV is a high-speed multimedia performance monster with a 16-megapixel Canon CMOS sensor, Dual DIGIC 4 Imaging Processors, and 14-bit A/D data conversion, all at 10 frames-per-second (fps), with the widest ISO range Canon has produced to date. This new camera also features 1080p Full High-Definition video capture at selectable frame rates packaged in Canon’s most rugged and durable professional camera body. 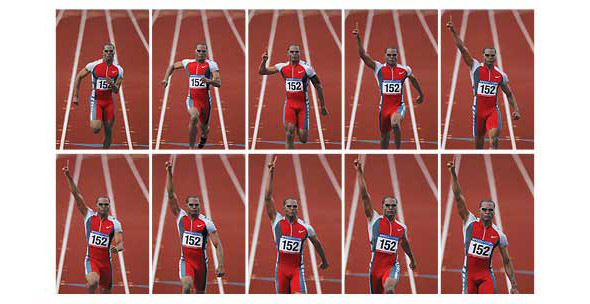 The crowning achievement of Canon’s 1D Mark IV Digital SLR is its new autofocus system that starts with 45 AF points including 39 high-precision cross-type focusing points capable of tracking fast moving athletes or wildlife accurately at speeds up to 10 frames per second. With greater subject detection capability than ever before plus a newly redesigned AI Servo II AF predictive focusing algorithm, the Canon EOS-1D Mark IV camera sets new standards for autofocus performance among professional digital SLRs. Whether shooting for the six o’clock news or the front page, the EOS-1D Mark IV Digital SLR is the quintessential camera to freeze fast-moving action with high-speed stills or capture stunning HD video with dynamic color and image quality. To accompany the new EOS-1D Mark IV Digital SLR camera, Canon is also announcing a new accessory, the WFT-E2 II A wireless file transmitter providing photographers with a wide range of professional digital connectivity options. “Canon works hard to be the imaging leader in all our business endeavors. This goal has fueled our innovation and R&D efforts to engineer the most advanced autofocus system Canon has ever produced. We are proud to announce the camera that will deliver the ultimate in imaging quality to professionals working in all areas of multimedia imaging, whether it’s action photography, photojournalism or HD video and cinematography,” stated Yuichi Ishizuka, senior vice president and general manager, Consumer Imaging Group, Canon U.S.A. The Canon EOS-1D Mark IV camera will intrigue professional photographers in virtually every category from photojournalism and sports through nature, wedding, portrait and fashion to commercial, industrial and law enforcement. What makes the EOS-1D Mark IV camera different from its predecessors, in addition to numerous focusing system and image quality improvements, is its exceptional Full HD video capture capability. With this new level of functionality, the 1D Mark IV Digital SLR is destined to appeal not only to professional still photographers but also to a diverse market of professional videographers and filmmakers who are looking for exceptional Full HD video quality, amazing low-light performance, outstanding portability and a level of durability unheard of in most HD video cameras in this price range. The new EOS-1D Mark IV Digital SLR camera features Canon’s most advanced Autofocus system to date. It is equipped with a newly developed 45-point AF sensor featuring 39 high-precision cross-type AF points, and an all new AI Servo II AF mode that gives still photographers the power and performance to track and focus a fast-moving subject at speeds up to 10 frames per second. With more than twice as many cross-type focusing points as the EOS-1D Mark III and a new AF sensor construction that improves performance in low light and with low contrast subjects, the EOS-1D Mark IV has greater subject detection capabilities than any previous EOS model. 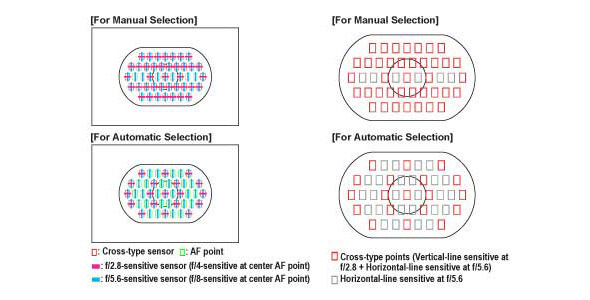 To complete the range of AF improvements, Canon has developed a new AI Servo II AF predictive focusing algorithm that significantly improves responsiveness and stability by making better decisions on focus tracking in a variety of shooting conditions. Wedding and event photographers shooting in low light without the benefit of a flash can take advantage of Canon’s widest ISO range and highest performance ever. The EOS-1D Mark IV camera’s ISO speed settings range from 100 up to 12,800 in 1/3 or 1/2 stop increments with ISO Expansion settings of L: 50 for bright light or H1: 25,600, H2: 51,200, and H3: 102,400 for even the most dimly lit situations. Photographers and documentary filmmakers working in available light will be impressed by the low-noise image quality of the 1D Mark IV, capturing amazing still images and video footage even at speed settings as high as ISO 12,800. High ISO, low light still images are further enhanced by Canon’s adjustable High ISO Noise Reduction feature, now a default setting in the camera. APS-H-sized image sensor that’s similar in size to a Super 35mm motion picture film frame. The large sensor allows filmmakers to achieve shallow depth-of-field just as cinematographers have traditionally done using much higher-cost motion picture equipment. The more than 50 Canon EF lenses compatible with the EOS-1D Mark IV give videographers incredible creative options, including an impressive selection of large-aperture professional L-series primes as well as zoom lenses, macro, Tilt-Shift and Fisheye optics. 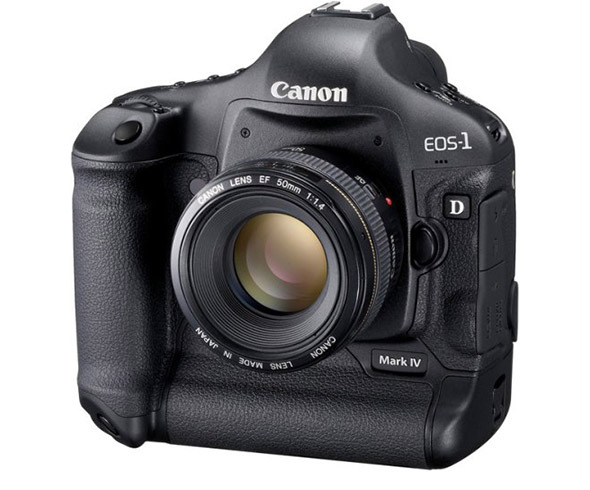 The Canon EOS-1D Mark IV allows for three video recording resolutions – 1080p Full HD and 720p HD in a 16:9 aspect ratio and Standard Definition (SD) in a 4:3 aspect ratio. The camera will record Full HD at 1920 x 1080 in selectable frame rates of 24p (23.976), 25p, or 30p (29.97); and 720p HD or SD video recording at either 50p or 60p (59.94). SD video can be recorded in either NTSC or PAL standards. Sound is recorded either through the internal monaural microphone or via optional external microphones connected to the stereo microphone input. The camera also provides an in-camera video editing function allowing users to remove the start or ending of a video clip directly in the camera to eliminate unwanted footage and speed up post-production. The heart of the EOS-1D Mark IV camera’s outstanding image quality is a newly developed 16.1-Megapixel CMOS sensor featuring Canon’s latest and most advanced proprietary technologies. These technologies include improved photodiode construction to enhance dynamic range and gapless microlenses that are positioned closer to the photodiodes for improved light gathering efficiency. The transmissive quality of the color filter array has been enhanced to improve sensitivity. Canon has also upgraded the sensor circuitry to improve noise reduction before the image data is exported from the CMOS sensor to the rest of the image processing chain. With 60 percent more pixels than the EOS-1D Mark III, the EOS-1D Mark IV Digital SLR employs Dual DIGIC 4 Image Processors with approximately six times the processing power of DIGIC III for full 14-bit A/D conversion at 10 fps. High-speed continuous shooting up to 121 Large JPEGs is possible using a UDMA CF card. This camera also features three RAW shooting modes for versatility with Full RAW (approx. 16 million pixels), M-RAW (approx. nine million pixels), and S-RAW (approx. four million pixels). Three additional JPEG recording formats (M1, M2 and Small) are also available. The 14-bit per channel conversion facilitated by the dual DIGIC 4 Processors provides smoother tonalities in final images capturing all 16,384 distinct tones in each channel (red, green and blue) at the full 10 fps frame rate. RAW images shot on the new Canon EOS-1D Mark IV use the entire 14-bit space when converted to 16-bit TIFF files in Canon Digital Photo Professional (DPP) software, which is supplied with the camera at no extra charge. The 14-bit A/D conversion is also the foundation for Canon’s Highlight Tone Priority feature that takes maximum advantage of the camera’s extensive dynamic range to preserve detail in highlight areas of the image. Canon’s new EOS-1D Mark IV Digital SLR also features an improved white balance algorithm making colors more accurate when shooting under low color temperature light sources such as household tungsten lamps. The EOS-1D Mark IV Digital SLR features Canon’s Peripheral Illumination Correction function which corrects darkening that can occur in the corners of images with most lenses when used at their largest apertures. When activated, it is automatically applied to JPEG images and video clips as they are shot. For RAW images, it can be applied in DPP software. Other new features include a large three-inch solid structure Clear View II LCD screen with 920,000 dot/VGA resolution and a wide 160-degree viewing angle for enhanced clarity and more precise color when reviewing images and shooting video. The new in-camera copyright information feature helps professionals secure control over images by setting copyright data directly into the camera and appending that information to each image file in the Exif metadata. Additional features include a fluorine coating on the Low Pass Filter to further repel dust and enhance the EOS Integrated Cleaning System. Action photography truly is all about speed, capturing a fast subject with fast focusing and fast frame rates. However, all this speed might be wasted if it is slowed down by lengthy post-production procedures to adjust image quality. The EOS-1D Mark IV Digital SLR helps reduce post-production work with a powerful new Auto Lighting Optimizer (ALO) system. When enabled, Canon’s ALO automatically adjusts the image for optimal brightness and contrast on the fly during in-camera image processing, reducing clipped highlights while keeping shadowed areas as clear and detailed as they actually appear. By optimizing brightness and contrast in-camera, Canon’s ALO system significantly reduces the need for post-production image optimization, and gives photographers image quality they can take directly to press. Demanding professional photographers who tested ALO clearly stated that this one feature will reduce their post-production image optimization process by more than 75 percent. Canon’s ALO works with both RAW[i] and JPEG images as well as video recording. Canon has taken every measure to ensure that the EOS-1D Mark IV Digital SLR camera has the highest degree of weather resistance in the EOS line. The 1D Mark IV camera incorporates a wide range of design features that enhance its durability and reliability for professional assignments. For example, the 1D Mark IV’s body, chassis and lens mount are completely weather-resistant and 76 gaskets and seals surround all buttons and seams. The body covers and internal chassis, including the mirror box, are constructed with magnesium-alloy, one of the strongest and rigid metals available for its weight. For added strength, the lens mount is constructed with stainless steel. In fact, when used with Canon’s Speedlite 580EX II and/or most current L-series lenses, the entire camera system remains fully weather resistant, so professionals can concentrate on getting the shot instead of worrying about protecting their gear. Canon is announcing the availability of the new WFT-E2 II A* wireless file transmitter exclusively for the EOS-1D Mark IV Digital SLR camera. The WFT-E2 II A wireless transmitter is an extremely small and versatile device that offers professional photographers a wide range of digital connectivity options including IEEE802.11a/b/g and Ethernet, ideal for commercial and studio work. In addition to adding the ability to connect to wireless networks over 802.11a, the new WFT-E2 II A adds a wealth of new professional features to the photographer’s tool kit. The new Camera Linking feature allows a single photographer to simultaneously fire up to 10 cameras remotely; and the updated WFT Server mode lets you remotely use Live View, control settings, and fire the EOS-1D Mark IV over the internet from anywhere in the world using a standard Web browser or many Web-enabled smart phones. Additionally, geotagging is now possible via Bluetooth, using compatible GPS devices to append coordinate data to the images. The Canon EOS-1D Mark IV Digital SLR camera is scheduled to be delivered to U.S. dealers in late December, and will be sold in a body-only configuration at an estimated retail price of $4,999.00[ii]. Final pricing and availability for the Canon WFT-E2 II A wireless file transmitter will be available later this year.